Using local and organic ingredients, sustainable practices, and lots of love, Flour City Pasta is an artisanal pasta maker based near Rochester, NY. 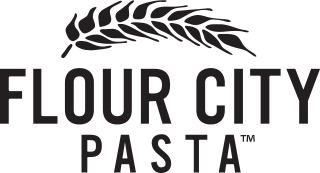 Flour City Pasta partners with farmers in the area and sources local materials, such as spent brewers grain, distillers' grain, and wine pommace, to create original offerings that literally carry the flavors of the region with them. Unlike factory-produced commercial pasta, which is dried at very high temperatures very quickly, Flour City Pasta is dried "low and slow" - this extended drying process allows the pasta to ferment slightly, creating a unique, unforgettable and delicious flavor profile.